One of the reasons we love sending our clients to the Caribbean or Mexico is for the stunning views. One of the best ways to take in the views of the sparkling sea and cotton candy sunsets is perched on the edge of an infinity pool. 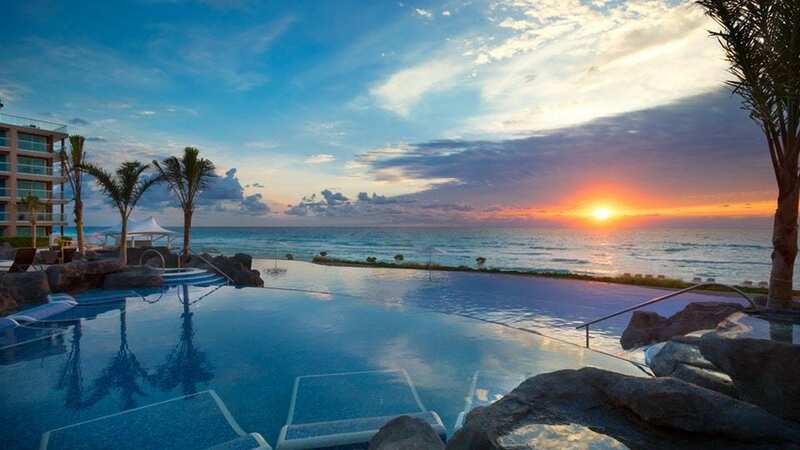 Check out our list of the best infinity pools in the Caribbean and Mexico, below! Jade Mountain is one of the most romantic resorts in the world. 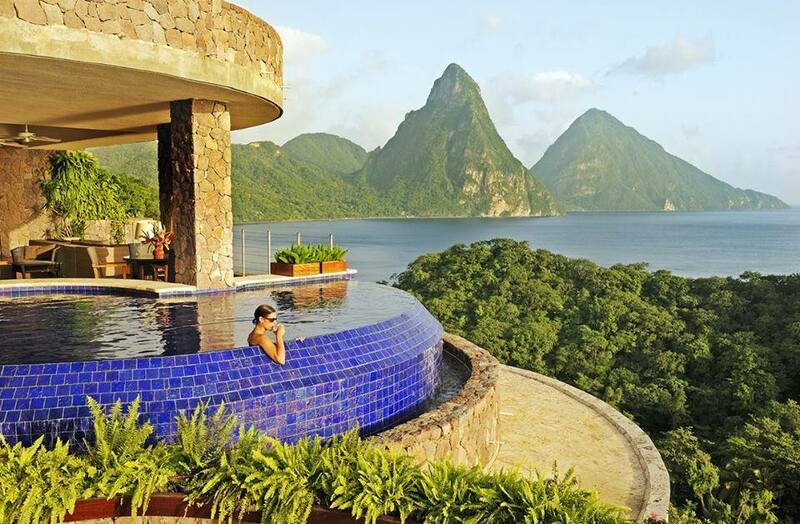 With amazing views of the Pitons and a unique design, honeymooners or couples flock to this paradise by the tenfold. The open air rooms, which Jade Mountain rightfully refers to as “sanctuaries”, are perfect for taking in the views. Not only is the main infinity pool absolutely breathtaking, but each of the 29 sanctuaries has its own infinity pool as well! Just one island away from Jade Mountain in St. Lucia, you’ll find the all-inclusive, couples-only Sandals LaSource Grenada. Set on a sprawling 17-acre property on the southwestern tip of Grenada, you’ll find an absolutely gorgeous infinity pool that rivals Jade Mountain. The property has multiple pools. You’ll find one main pool (not an infinity pool) with loud dance music, games, and activities. But don’t worry! Guests looking for a quiet respite and gorgeous views can head to the infinity pool at the end of the resort’s South Seas Village area. You can request a room that is in this area if you love infinity pools and are looking to relax. In addition, the property has newly renovated suites with their own stunning infinity pools. 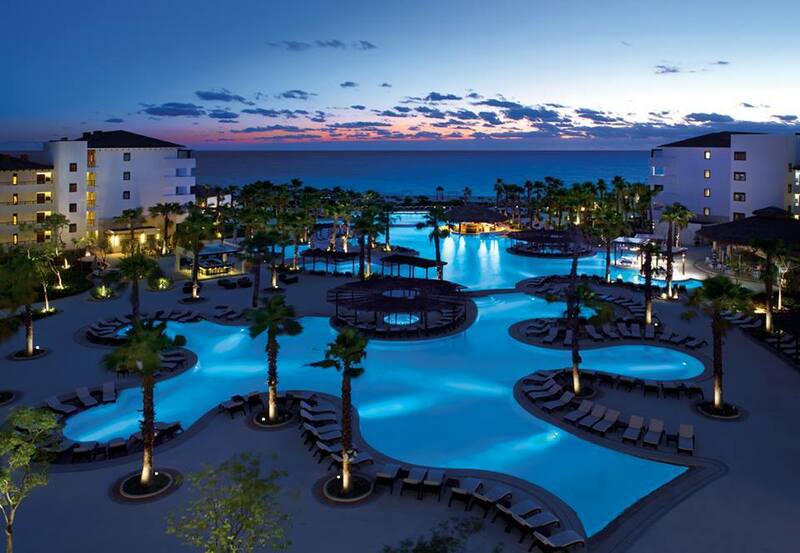 Secrets Playa Mujeres Golf & Spa Resort is an all-inclusive property located about 30 minutes from downtown Cancun. You’ll find multiple pools here as well, including one of the largest infinity pools on this list. 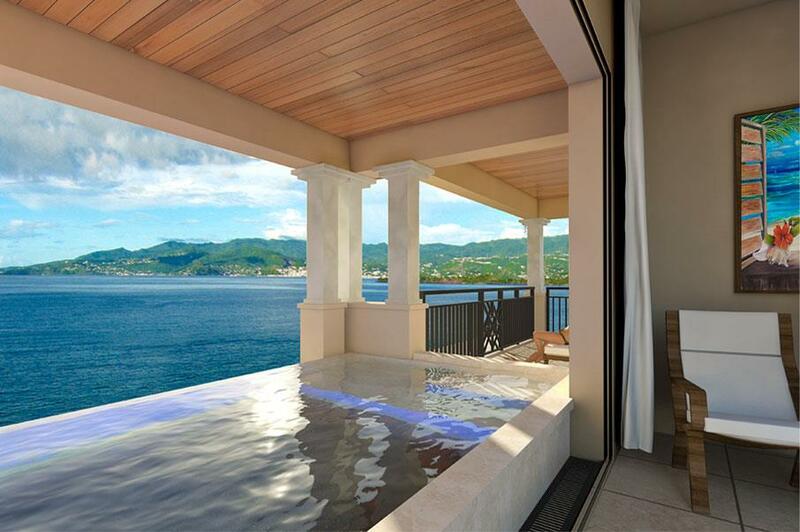 It overlooks the private beach on the Caribbean Sea. Spend some time perched on the edge of the infinity pool, then head to the cabanas and sunbeds near the sea that dot the white sand below. If you’re looking for action and relaxation, you’ll find both at the Thompson Playa del Carmen resort. Located directly on the bustling Fifth Avenue, this 92-room property features a 30,000 square foot rooftop infinity pool with cabanas, sun beds, and in-water lounge chairs. 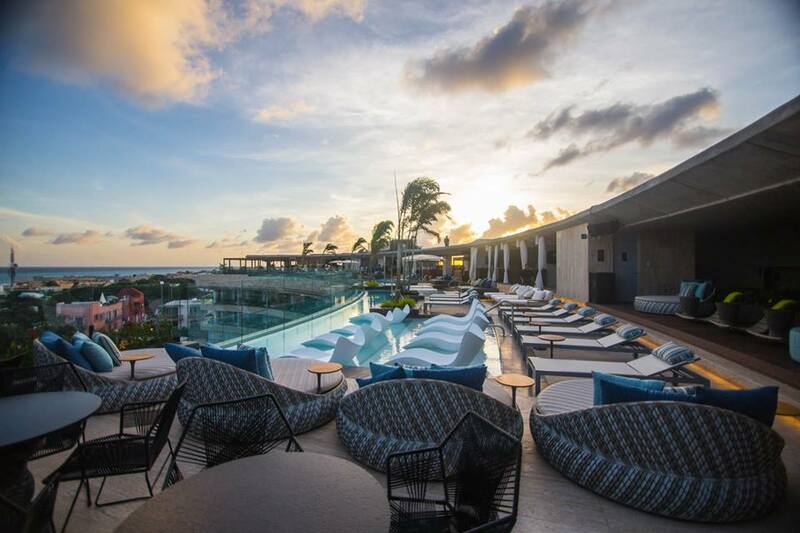 Take in the 360-degree views of downtown Playa del Carmen and the Caribbean Sea, thanks to the resort’s location on the city’s highest point. This is the perfect place to rest up for a night out on Fifth Avenue. Here you’ll find tons of restaurants and bars, a vibrant nightlife scene with tons of nightclubs, and lots of shopping including small boutiques, high-end designers, and American brands like H&M and Sephora. 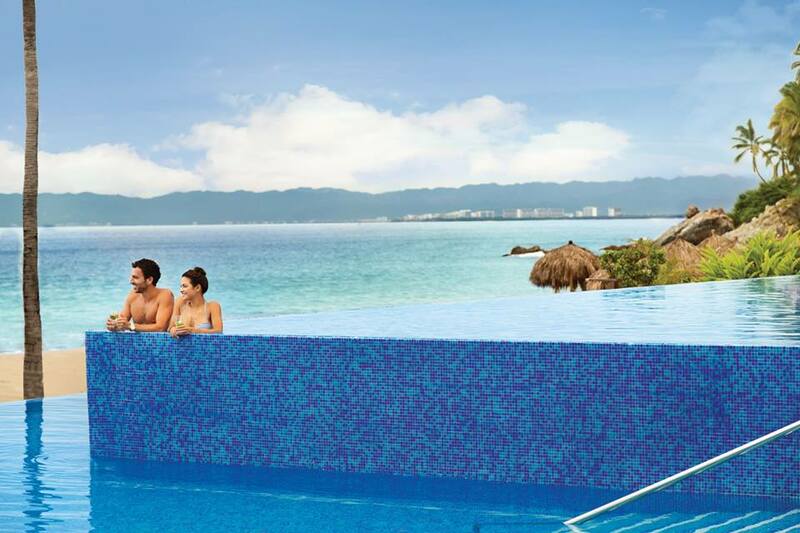 If you choose to stay at the Hyatt Ziva Hotel in Puerto Vallarta, you’ll have your pick of half a dozen pools on the property. In fact, it has five infinity pools! Some of the rooms also boast their own infinity pools. You may also opt for a swim up room which has access to a semi-private swimming pool directly from your patio. This property is truly a pool-lovers paradise! In addition to gorgeous ocean views, Hyatt Ziva is located at the southernmost tip of Puerto Vallarta, which is surrounded by a lush jungle and gorgeous mountains. This part of the bay is known for it’s unparallelled views and largely uncrowded beaches. If you’re looking for a stunning infinity pool in a party setting, look no further than the classic Hard Rock Hotel in Cacun. This all-inclusive property was designed with entertainment in mind. It’s unique infinity pool is shaped like a lagoon with waterfalls and multiple levels. You’ll find areas to join the party, as well as more private areas for a bit of relaxation. Design lovers will also love the modern suites with cutting edge technology. You’ll feel the high-energy of the property in every corner! Call us today at 402-390-9291 to book your stay at one of these stunning properties. You can also get started here.